At Daisy Mountain Dentistry, we know how important a healthy smile is to you. It’s important to us, too, and we’d love to help you develop optimal oral health and a smile you love. Dr. Peter Vogel, Dr. Paul Owens, and our team offer gentle, personalized dental care that’s tailored to each patient’s unique needs. We take pride in providing quality treatment in a comfortable, friendly atmosphere where you are the top priority. Our doctors will create a care plan that is customized to your situation. They focus on preventive care and conservative treatments. We promise your smile will soon be looking incredible! 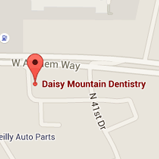 Daisy Mountain Dentistry, in Anthem, AZ, serves patients from Phoenix, New River, and surrounding communities. Please call to learn more and schedule a visit. Dr. Vogel, Dr. Owens, and our team look forward to welcoming you to our dental family. We’d love to help you develop the healthy, beautiful smile you deserve!